We have been getting out to see whales recently. We did see 2 adults putting on a good show while feeding close to Depoe Bay and another right in the bay itself close to the Harbor. Dockside Charters has excursions scheduled daily, weather permitting. Sightings on our excursions have been good with multiple sightings on most trips. Making your reservation to have a marine adventure and see some of these amazing animals from the largest cleanest boats on the coast. Call 541-765-2545 or make your reservation on line at docksidedepoebay.com Online reservations can be made up to one hour before departure time. Online Discount! Book your Whale Watching trip NOW! 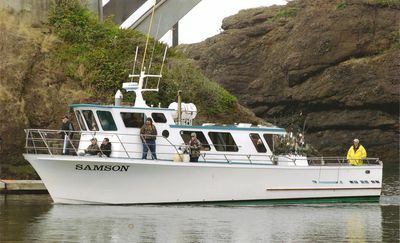 Depoe Bay is the Whale Watching Capital and Dockside Charters offers Premier Whale Watching Excursions. 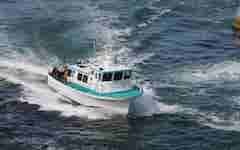 Dockside Charters runs whale watching excursions on a daily basis during our whale watching season. The season typically goes from mid-December through October. Our whale watching season actually is two part: migration and residential. The migratory season begins in December and usually extends until mid May. Mid to late May is when our “resident” whales begin to arrive. Our resident whales are a group of roughly 20 whales that, though they do migrate don’t go all the way to the Bering Sea but rather feed during the summer season within just a few miles of Depoe Bay and stay in the area until late October. The same whales return year after year and we are able to identify returning whales by their individual markings and the skippers even have them named. Pacific Gray Whales have the longest migration of any animal on earth going from the Bering Sea to the Baja Peninsula and even into the Sea of Cortez. Their migration allows calves to be born in the warm waters of the Baja lagoons, that is vital to the survival of the newborns because they have no insulating blubber layer at birth. As the new calves and their mothers slowly migrate North the calves gain about nine to ten pounds per day. What makes that even more remarkable is the fact that the cows (mother gray whales) feed very little if at all during the migration. This is often quite evident by the physical appearance of the cows when they reach Depoe Bay, they are literally racks of skin and bones, having used their fat reserves to support the calves during migration. After they arrive here feeding is the priority. Pacific Gray Whales are baleen feeders, they filter food they need from the water by straining it through their baleen plates. Organisms they feed on are quite small, one of the whales most important food sources are Mysid Shrimp. Mysid Shrimp live in and around kelp forests and never get more than about a half inch in length. They resemble mosquito larva more than shrimp and the whales will consume up to 2000 pounds of them a day. At other times they will feed on copepods they filter by taking mouthfuls of muck from the bottom or even skim feed on schools of very small fish. 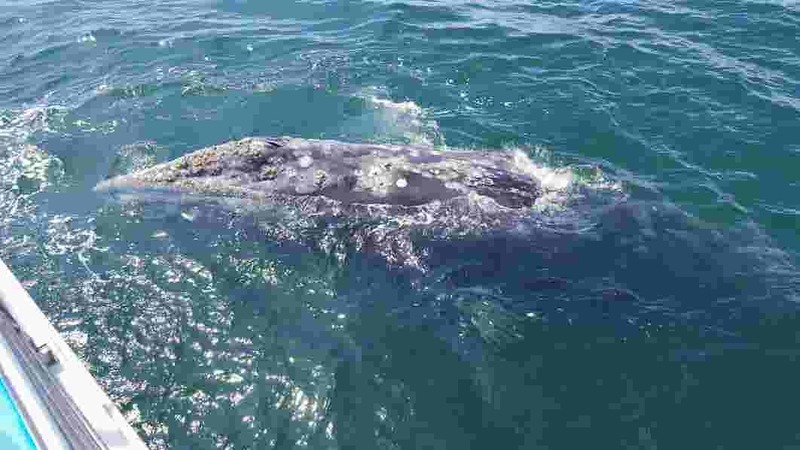 Humpback and Blues whales are also seen occasionally though not as frequently as Gray Whales. We are fortunate here in Depoe Bay to have whales nearby for us to see for most of the year. 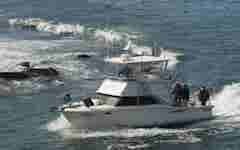 At Dockside Charters we run our Whale Watching excursions from safe comfortable 50 foot Delta Charter boats. They are Coast Guard Certified and have everything required for your safety and piece of mind. They have all the amenities: comfortable heated cabins, rest rooms, indoor seating, seating out on deck. You are able to walk all the way around the boats and are elevated above the water for excellent whale sightings. Our captains have decades of experience and a wealth of knowledge they share during the excursions making them interpretive tours. Our boats have access doors to walk on and off with ease or provide wheel chair access. We can accommodate large groups. Whale watching excursions seven days a week, subject to marine conditions.